SAN MATEO, Calif. – April 14, 2016 – Snowflake Computing, the cloud data warehousing company, today announced new features, third-party validations including support for HIPAA compliance, and a partner integration that together deliver a new standard in built-in security for cloud data warehousing. This comprehensive approach eliminates the complexity and burden of securing data that other solutions place on the customer, giving customers the peace of mind needed to trust important data to the Snowflake Elastic Data Warehouse. Snowflake’s announcement reinforces the growing recognition that security in the cloud can meet demanding customer requirements. In fact, Gartner predicts that by 2017, the number of enterprises with policies against placing any sensitive data in the public cloud will have dropped to 5%. By building end-to-end security into its data warehousing service, and offering encryption everywhere, Snowflake ensures that customers can safely move data to the cloud and use the Snowflake service to power their analytics without the increasingly heavy burden of securing their own data environment. Always-on Enterprise grade encryption. Snowflake automatically encrypts all customer data by default, in transit and at rest, using the latest security standards and best practices at no additional cost. Multi-factor authentication. 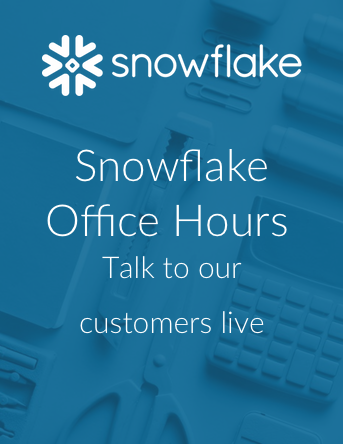 Snowflake offers integrated multi-factor authentication, to further control access to the Snowflake service, and to reduce the threat of brute force attacks. Federated Services. Snowflake offers federated services for organizations that want to leverage their existing SAML 2.0 investments. Automatic key management. Snowflake rotates account and table keys on a regular basis, entirely transparent to the customer and requiring no configuration or management. Intrusion Detection. Integrated SIEM services for monitoring and notifying customers of potential suspicious activities to help them thwart attacks. Role based access. Snowflake allows role based access and control for both data access and operation. Dedicated Instances. For customers with sensitive data who need added security including compliance requirements in a virtualized environment, Snowflake offers the option of dedicated compute resources. Snowflake has also partnered with Okta, the leading provider of identity and mobility management for the cloud and mobile enterprise, to help customers integrate Snowflake security with their broader application environment. This integration enables Snowflake customers to use Okta’s federated authentication services to extend their own authentication mechanism within the Snowflake service. Snowflake has also received key third-party validations of its service and processes, including a Service Organization Control (SOC) 2 Type II report and HIPAA compliance. SOC 2 is an industry standard that validates the security of infrastructures and services for cloud-based service providers. The HIPAA Security Rule (issued under the Health Insurance Portability and Accountability Act of 1996 or “HIPAA”) requires appropriate administrative, physical and technical safeguards to ensure the confidentiality, integrity, and security of electronic protected health information.. The Snowflake Service enables customers who are regulated by HIPAA to store and analyze data in a manner that meets HIPAA Security Rule requirements. Snowflake’s comprehensive approach provides customers the assurance they need to store and analyze their data in the cloud. CapSpecialty, a preferred provider of specialty insurance products to the SMB market, uses Snowflake’s secure data warehouse as a service to analyze 10 years of data (read more). “While selecting the right service, we came to the conclusion that achieving the level of security provided by Snowflake could only have been done internally at a far greater cost,” said Bob Asensio, CIO CapSpecialty. To learn more about how CapSpecialty uses Snowflake’s secure service to perform queries 200x faster, click here. Snowflake Computing, the cloud data warehousing company, has reinvented the data warehouse for the cloud and today’s data. The Snowflake Elastic Data Warehouse is built from the cloud up with a patent-pending new architecture that delivers the power of data warehousing, the flexibility of big data platforms and the elasticity of the cloud – at a fraction of the cost of traditional solutions. Snowflake can be found online at snowflake.net.